NASA astrobiologist Chris McKay in the Mojave Desert, a frequent research destination in his search for extraterrestrial life. Chris McKay likes to travel, preferably to exotic, faraway lands. Mars is the usual destination, but Jupiter’s moon Europa and Saturn’s moons Enceladus and Titan are also on his itinerary. McKay, a planetary scientist at NASA’s Ames Research Center, ventures to some of Earth’s most extreme environments to study the closest facsimiles he can find to Mars and other distant outposts, on a mission to learn how life might exist beyond our planet. Over the past 30 years, McKay’s adventures have included an invigorating swim in an Antarctic lake beneath more than 10 feet of ice. He’s endured black clouds of mosquitoes in the Siberian permafrost zone and prepared for polar bear attacks in the northernmost reaches of the Canadian Arctic. He’s squirmed through tunnels no wider than a watermelon in the bowels of America’s deepest cave, more than 1,000 feet below Earth’s surface. While the work can be exhilarating — and certainly has its perils — McKay is not looking for thrills. He’s focused on determining the minimal conditions necessary to sustain life. McKay found his calling the usual way: entirely by accident. Growing up in Florida, he had no particular interest in space, though he did like science. He studied physics in college and, by chance, found an old telescope in a laboratory closet and pulled it out to look at stars and planets. Eventually, he built his own telescope. McKay started graduate school in astrophysics at the University of Colorado in 1976, the same year the Viking 1 and 2 landers touched down on Mars, yielding results that puzzled him. “Here was a planet with all the elements needed to support life in its atmosphere, with evidence of liquid water in the past, and yet there was no life — [as if] Mars had the lights on, but nobody was home,” he says. Chris McKay believes that humans ultimately need to set foot on the Red Planet. At the moment, there’s no serious proposal to send humans to Mars, either. But McKay got as close as he could in 1980, when he accepted a planetary biology internship at NASA Ames. There he met biologist Imre Friedmann, who was looking for someone to build temperature and moisture sensors as part of a field expedition to Antarctica’s Dry Valleys. McKay signed up for the job. On a continent that’s 98 percent covered in ice, the Dry Valleys are Antarctica’s exception: a combination of low humidity, topography and robust wind patterns has left the area largely surface ice-free and, at first glance, apparently lifeless. But Friedmann discovered an extensive ecosystem of microorganisms living beneath the surface of porous rocks. It was not only McKay’s first journey to a Mars-like environment; it was also his first trip outside the country. “The experience changed my life,” he claims. McKay says he realized that “a lot of what I learned about building instruments in astrophysics could be useful to biologists,” including the equipment’s capability for recording data remotely and over long periods. He also made a more personal discovery. After getting his doctorate degree in 1982, McKay was hired at Ames to study planetary atmospheres. “The wordlife was not part of my original job description,” he says. But over time, the question of life on other worlds took hold of him and eventually sent him around our world, including return trips to study the Dry Valleys’ microbes. In January 2013, his colleagues began testing a drill there for a proposed NASA mission called Icebreaker, which, if approved, will bore into the ice-cemented ground of northern Mars. The best outcome, from McKay’s standpoint, would be finding life different from that on Earth, which could expand our view of biology in a profound way. Astrobiologist Chris McKay travels to the world's harshest landscapes to search for clues about the potential for life on other planets. He's endured clouds of mosquitoes in the Siberian permafrost and prepared for polar bear attacks in the Canadian Arctic. McKay calls his favorite field sites — picked for both scientific and aesthetic reasons — the “seven wonders of the Mars analog world.” But his search to understand possible alien ecosystems isn’t limited to the Red Planet. His research trips have taken him to Saturn’s moons and the volcanoes of Venus — or at least, as close as he can get without leaving terra firma. The Namib in southern Africa is one of the world’s foggiest deserts, and fog is the main source of moisture for its western region. When McKay visited in 2012, he learned that the foggy western Namib supported as much microbial life as the eastern part of the desert, where rain provides limited moisture. It’s relevant because there is no rain on Mars, also a desert, but there is fog. Of course, Mars is much colder than the Namib, making the match far from exact. Fog’s important role in sustaining microbial life drew McKay to the southern African desert, but the Namib also features some of the world’s tallest sand dunes, rising as high as 1,000 feet. These dunes are linear, or longitudinal, formed when winds blow in two predominant directions, varying seasonally — like the dunes on Titan, Saturn’s largest moon. Titan’s dunes are gigantic by any standard, covering about 13 percent of the moon’s surface, about 4 million square miles in all. Some stretch for hundreds of miles. Extrapolating from what we know about the Namib’s dunes, Titan’s longitudinal dunes offer clues about its global circulation patterns and might one day be used to predict its weather. The Tanzanian peak looks like a classic conical volcano from a distance. But instead of the red-hot lava we associate with volcanoes, what pours out of Ol Doinyo Lengai looks more like motor oil. It’s the only active volcano in the world that spews “carbonatite” lava, composed primarily of carbonate minerals rather than more common basalt lava. Despite its dark hue, carbonatite lava has the lowest viscosity of any known lava, making it extremely runny. Studies of Ol Doinyo Lengai and its unusual lava may help solve a puzzle related to Venus, which has more than 1,000 volcanoes and a surface riddled with about 200 lava channels. One of these channels is about 4,200 miles long — the longest in the solar system and longer than the Nile. To create such a feature, lava would have to remain fluid over great distances, prompting geologists to suggest that Venusian volcanoes discharge carbonatite lava, just like that one oddball volcano on Earth, Ol Doinyo Lengai. Liquid water is an essential prerequisite to life as we know it. McKay and his colleagues found one region of Chile’s Atacama so dry that absolutely nothing grows — a discovery, as often occurs in science, made purely by chance. “We put our meteorological station in the middle of this desiccated zone only because people at the local university told us it was the safest place to leave our equipment where it would not be stolen,” McKay says. The Very Large Telescope (VLT), one of the world’s premier observatories, is just 50 miles from the research site. If McKay’s astrophysics career had taken a more conventional turn, he might have found himself atop Cerro Paranal, where the VLT is, rather than 5,000 feet below, scouring the desert for hints of life. The pursuit he’s chosen brings to mind a question raised by Victor Hugo in Les Misérables: “Where the telescope ends, the microscope begins. 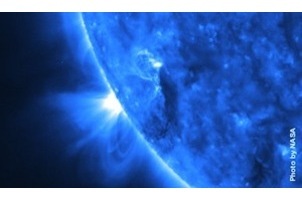 Which of the two has the grander view?” In astrobiology, McKay maintains, the combined view can be especially powerful. In 2008, McKay and his colleagues drilled through the ice covering Antarctica’s Lake Untersee and dove in, discovering colored mounds of bacteria on the lake’s floor unlike anything seen before. Untersee is a good model for Mars, he says, because it is supplied by subglacial melt — water that accumulates at the bottom of an ice pile — rather than from surface melting, which does not occur on Mars. This attraction for tourists and astrobiologists alike sporadically shoots steaming water from an underground hot spring 200 feet into the air. McKay has visited the Geysir — from which the term geyser originated — multiple times to understand how geysers and deep-sea vents might affect life. Geysers and deep-sea vents are hydrothermal phenomena in which water, heated and pressurized by molten rock, is released through vents at the land surface or into the oceans. Geyser activity has been seen on other worlds as well. The Voyager 2 spacecraft discovered four active geysers on Triton, Neptune’s largest moon. And images captured by the Cassini spacecraft revealed a gigantic plume emanating from a geyser on Saturn’s moon, Enceladus, which sends ice, water vapor and other chemicals thousands of miles into space. A more detailed analysis of the organic compounds contained in such plumes, which is the goal of proposed future missions, would constitute “the first step toward answering the question of whether life exists inside the subsurface of Enceladus,” McKay says. Visible from the Gulf of Mexico and rising about 18,500 feet above sea level, this snowcapped volcanic cone is the highest mountain in Mexico. McKay has visited the peak of Pico de Orizaba a dozen times to study the mountain’s tree line, which is the world’s highest. Buried under a sheet of ice 2.5 miles thick, Lake Vostok is the world’s seventh-largest freshwater lake and the largest of more than 300 lakes trapped beneath the Antarctic ice sheet. Its water may have been isolated for more than 15 million years. Although he’s written research papers about the lake, McKay has never been there. No human has, but human technology — in the form of a drill operated by Russian scientists — reached Vostok in 2012. Scientists analyzing samples of the lake’s waters have not yet released conclusive findings about possible microbial life, but discovering an ecosystem in Vostok would hearten McKay, who wonders whether a subsurface ocean of Jupiter’s moon Europa, which is covered with about six miles of ice, might similarly harbor life.